LEAP has a banner system! It can easily be added to the MAIN ADMIN of your website, and with a few tags added to your skin you can sell advertising space on your website. To access the Banner System, click to the MAIN ADMIN --> Banners. Once in you'll see the areas that have been defined on your website as Ad Space and the sizes of each of those areas. 1) Click on the Name of the banner area you wish to add it to or click "View" for that banner. That will bring up a list of banners that are associated with that area so you can scan the views/clicks for each banner or edit the functions. 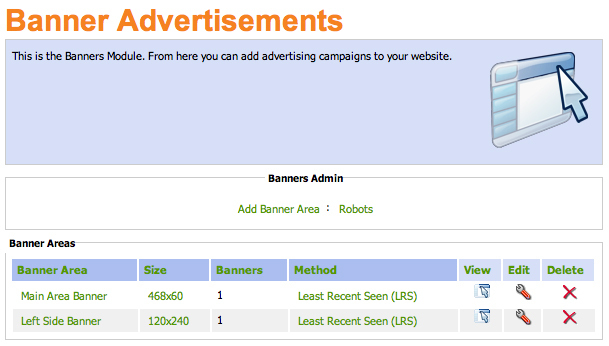 2) Once you have chosen the area you wish to add the banner to, then click "Add Banner Ad" under the Banners Admin functions. Note: Make sure you have the URL you wish to point the ad to and the graphic/file you wish to show on hand, you'll need this information for the next step. The Banner Name can be whatever of your choosing but make it something so you'll be able to track as you grow this database of advertisers. You can set your banner to go-live at a certain time, and expire at a certain time as to handle the contracts with your advertisers. Banner Priority becomes more useful the more banners you add. You can give some banners a higher priority which means they'll be seen more than others if you wish. Banner Type can be an image, Flash, Flash + clickTAGS, an external banner image or Raw Text. Destination URL is important. Often advertisers will provide a specific link that they track in their own campaign so it may include extra pieces after the root URL. Description, Keywords and Alt Text are used for Search Engines. You're site is already primed for them so why stop at the banners! Page Group(if your site uses them) or even a specific page for specific campaigns. That's it click "Add a new Banner Ad" to start the advertisers campaign. That's adding a banner to your Banner System. Is the guide confusing? Doesn't make sense? You know all this and need more? How does this apply to your site? Ask us your questions! and we can help.